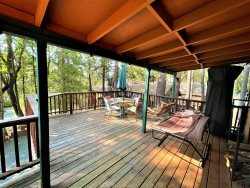 This beautiful lakeside property is only 1 mile from downtown Twain Harte. Enjoy this one of a kind vacation setting. This home is beautifully sited on a sunny knoll overlooking Brentwood Lake. THe "Great Room" and dining area are open to a well appointed chef's kitchen. The dining table seats eight with additional seating at the counter in the kitchen area. On the backside of the kitchen, you will find a spacious laundry area with plenty of room to store your vacation goodies. There are four bedrooms in total, the "kids" room has a set of bunk beds, a double on the bottom and a single on the top and a trundle equaling two single beds. There are comfy queen beds in the second and third bedrooms and a king bed in the master suite. The full guest bathroom is in the hall between the bedrooms. The living room is well appointed with a large flat screen TV with cable and WiFi. The energy efficient wood burning stove will keep you cozy on those chilly winter nights. Now we come to the incredible deck...ah yes, the deck. The deck is right on the water, overlooking lots of natural landscaping. The deck is mostly covered for comfortable afternoon shade. The hot tub area has been left open for the sun worshipers, also overlooking the lake. There are NO lake privileges with this home. There is great pride of ownership in this home and the owners welcome guest feedback to improve your vacation experience. We must have 24 hour notice prior to your arrival. After hours number is 209-770-1624. A short 1 mile drive will bring you to the heart of our Twain Harte community. There are NO lake privileges with this home. Central heat and a great wood burning stove in the living room - wood is not provided but you can pick up a bundle of wood at the market. If you are comfortable using the wood burning stove, please burn wood only. Hot tub – please use at your own risk, we cannot be responsible for chemical reaction or personal safety. We must have 24 hour notice prior to your arrival. After hours number is 209-770-1624.